1′-4′ high. Distinctive, dark, cordlike rootstalks. Lower pinnules of leaf toothed, upper smooth.Description: Just after emerging from the ground, Bracken has a characteristic fiddlehead shape, a tightly curled leaf cluster borne on a stalk. As the plant matures the fiddlehead uncurls. The leaf divisions become progressively more simple as you proceed from the base of the stalk to the top. At the base of the stalk what appears as an array of leaves is actually a compound leaf. The plant may appear to be covered with a rusty colored felt. Habitat: Moist places, forest floor, ponds, streams, etc. CAUTION: Bracken has long been used as a food. It was eaten extensively by the Indians, is still a preferred food in Japan and can be found on the menus of a number of fancy restaurants in the New England States. But there may be some risk. The evidence is more suggestive than conclusive. In most cases, it is the older leaves that have been implicated in poisoning wehn fed to livestock over a prolonged period. it is known that Bracken contains thiaminase, an enzyme responsible for the breakdown of thiamine, which can result in vitamin B1 deficiency if uncooked Bracken is consumed in large quantities. The plant contains the carcinogenic compound ptaquiloside, and communities (mainly in Japan) where the young stems are used as a vegetable have some of the highest stomach cancer rates in the world. Consumption of ptaquiloside-contaminated milk is thought to contribute to human gastric cancer in the Andean states of Venezuela. The spores have also been implicated as carcinogens. It has been suggested that selenium supplementation can prevent as well as reverse the immunotoxic effects induced by ptaquiloside from Pteridium aquilinum. There is also a small unidentified molecule that destroys cells in the bone marrow of cattle resulting in a loss of white blood cells and impaired clotting of red blood cells. It must be mentioned that a cow fed exclusively on a diet of mature Bracken leaves for two months does not necessarily approximate the human equivalent of an occasional side dish of cooked Bracken fiddleheads. I should also mention that laboratory rats fed Bracken as the predominant part of their diet have developed stomach cancer. What this means to the forager is to definitely avoid consumption of the older fronds. Eating young cooked fiddleheads is delicious. Many foragers eat a reasonable quantity on special occasions. You’ll have to make your own decision. FOOD: The fiddleheads are collected while still tightly curled. A light reddish fuzz adheres to the outside of the curled leaves. Some books tell you to remove this fuzz. This is easier said than done. In general I just wash the fiddleheads under water as you would normally do for any vegetable and it is sufficient. Steam the fiddleheads for 5 minutes & serve with butter. During times of famine, people have used the tough rhizome of Bracken to make flour. Japanese use it in soup. Native Americans boiled and ate the root stalks, as they are starchy. The root is viscid, bitterish, and like most of the fern tribe, has a salty and mucilaginous taste. When burned, the ashes yield more salt than other vegetables. In Siberia and other northern countries, people brew the roots in their ale, mixing 1/3 of roots with 2/3 of malt. Pioneers would soak them in water with wood ashes for 24 hours, then cook the young leaves like pot herbs. 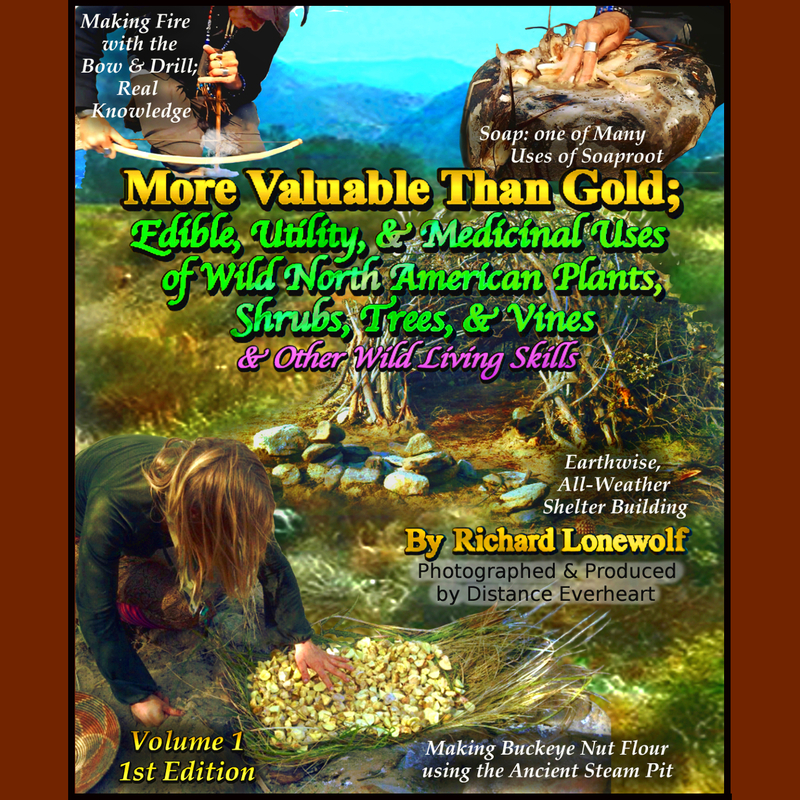 MEDIKIN: Native Americans used the root stalks as a diuretic & worm medicine. Ancients used the roots and whole plant in decoctions and diet drinks for the spleen and other disorders. Decoction of the leaves was used as a cure for rickets in children. UTILITY: Good as a fertilizer for potatoes if worked into the ground. Older, dried Bracken leaves make excellent bedding. Deer also seem fond of finding a dense stand of Bracken and using it for the night. Not only will deer sleep on the old fronds but they will compete with you for the yound fiddleheads. A good deer area can often be found by looking for tall Bracken stalks with nothing but a dried tip.